Like the town that inspired its name, the charming Honfleur guest room is as though untouched by time. With its elegance, calm, ample space and spa bath, it has everything you need for a wonderfully comfortable stay. The suite is generous in size and in terms of the organisation of its interior, which respects parents’ intimacy. In the lounge area, you will have a magnificent view over the Dives valley, with the lights of Caen and Ouistreham twinkling in the distance and above all the glittering blue water of the sea (22 miles (35 km) away as the crow flies!) and breathtaking sunsets. Here are a few details and photos, which speak for themselves . . . Antique furniture . . . Huge bathroom with a spa bath equipped with numerous wellness functions, shower. WC. Central heating. Softened water. Towel dryer in bathroom. Ventilation. 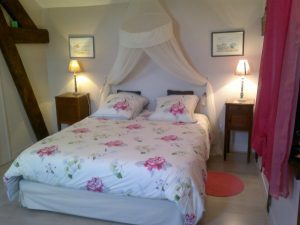 For a family holiday, a romantic break or a honeymoon, the Honfleur guest room awaits you! Located between two hills on the left bank of the river Seine, the Normandy fishing town of Honfleur is a highly popular tourist destination in Normandy. The town has kept all the charm of its prestigious historical past. The picturesque old port, old streets, slate house façades, museums and historic and religious monuments bear witness to an unparalleled architectural wealth. Nestled in greenery, the town offers an ideal place to relax in all seasons. It has been awarded four flowers in the competition for towns and villages in bloom. To discover the town of Honfleur and enjoy the wealth of its historical and artistic heritage, staying in a B&B is ideal. The Honfleur guest room offers you a warm welcome, a unique setting and allows you to discover the region’s gastronomic wealth, which includes the sand shrimp, the scallop from the Baie de Seine and shellfish! You will appreciate the charm of the guest rooms at Les Marronniers, which are perfectly suited to families with 2 children or couples who appreciate space and comfort.